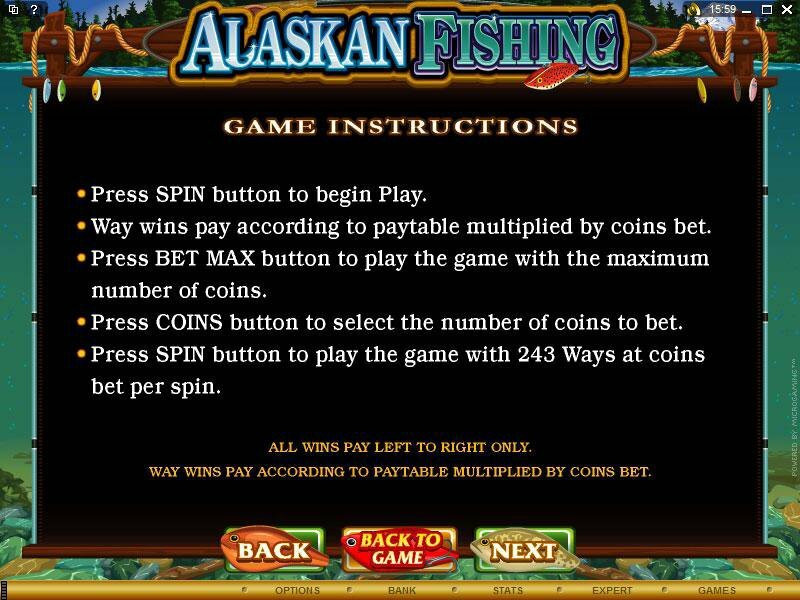 Overview: ALASKAN FISHING, the latest 5 reel video slot, is the second game in our advanced slot series that replaces traditional pay-lines with a bumper 243 different opportunities where the player can benefit substantially through Wild, Scatter, Free Spin and diverse Multiplier action. 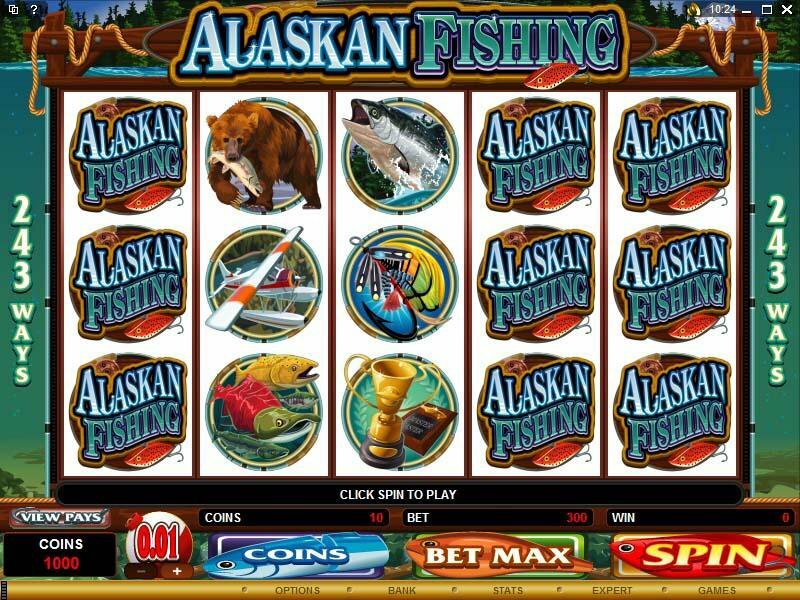 The scene is a fishing trip to the stunningly beautiful waterways, mountains and forests of the great state of Alaska, where the fish and the rewards are equally desirable and there's fun to be had through exciting combinations and the chance of significant wins. 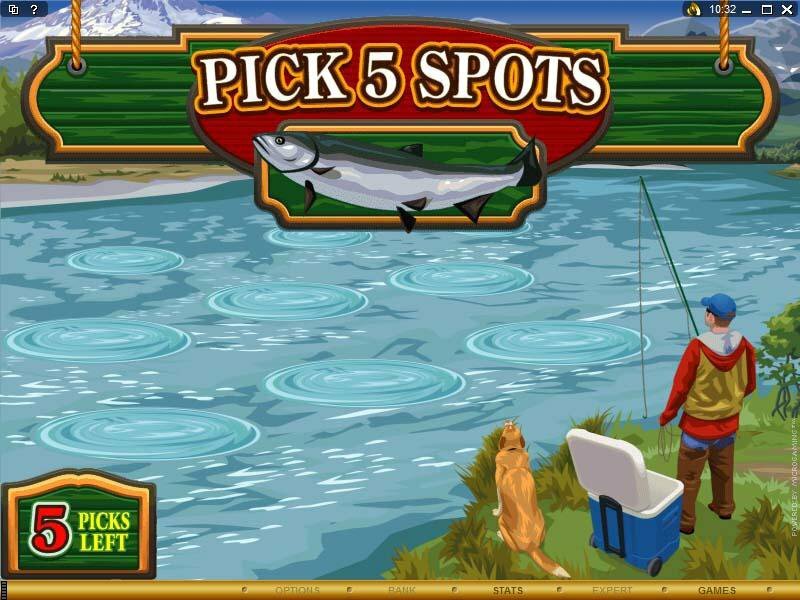 Colorful, true-to-life graphics faithfully carry the Alaskan theme and are replete with trophies, anglers, float planes into those remote mountain lakes, boats, wild animals, fishing gear and - of course - the appetizing fish themselves. 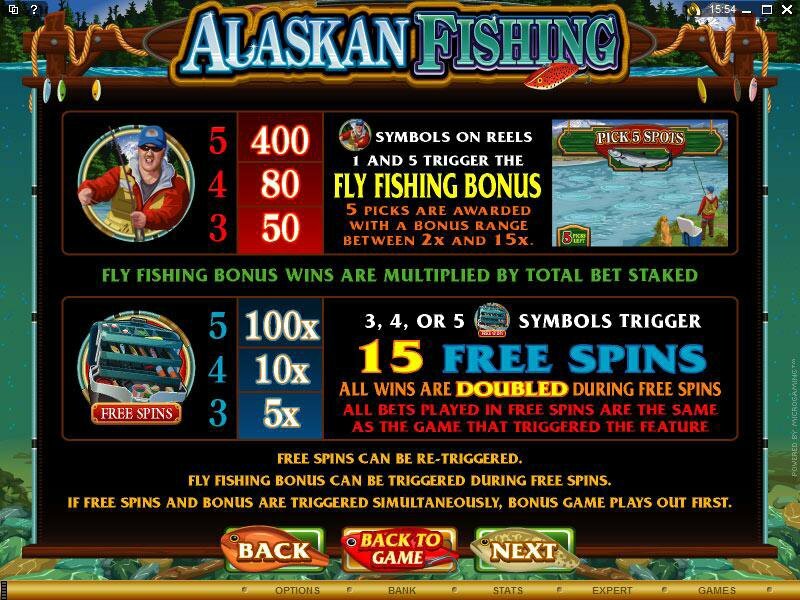 Appropriately enough, the Fisherman symbol on reels 1 and 5 trigger the Fly Fishing Bonus, where the player picks the 5 best fishing holes from a choice of 9 to go after a bonus range that runs between 2x and 15x the total bet made. 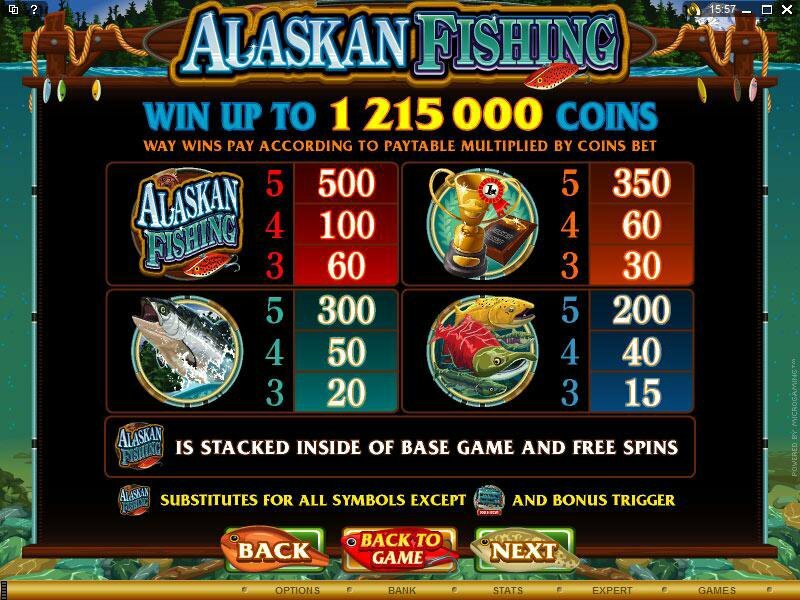 But it's the lure of the tackle box, acting as a Scatter, which brings the winning opportunities of Free Spins into action; 3, 4 or 5 of these initiates a re-triggering, 15 Free Spin feature in which all wins are doubled, and additional scatter pays between 5x and a very generous 100x can be awarded. Adding to the excitement, during this Free Spin cycle it is possible to re-trigger the Fly Fishing Bonus! 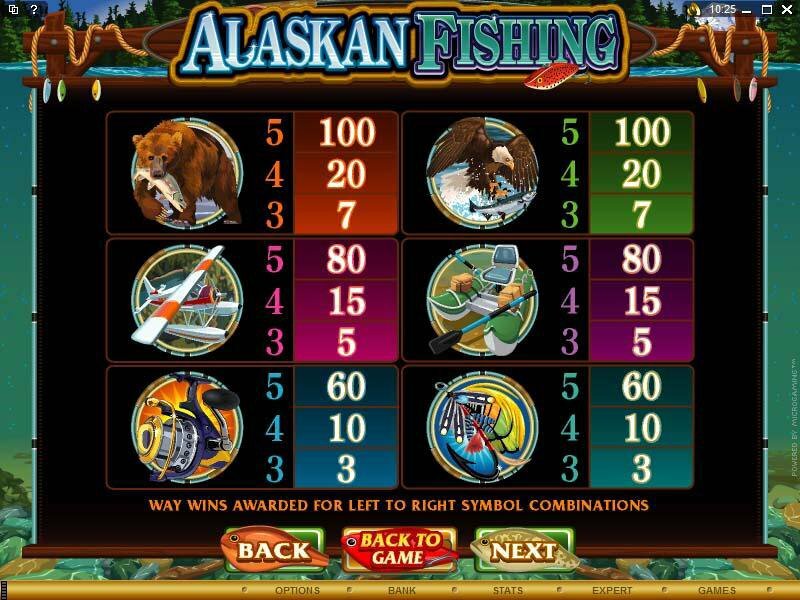 Look out, too for the Alaskan Fishing logo, which is Wild and substitutes for most other theme symbols, helping the player to create winning lines. 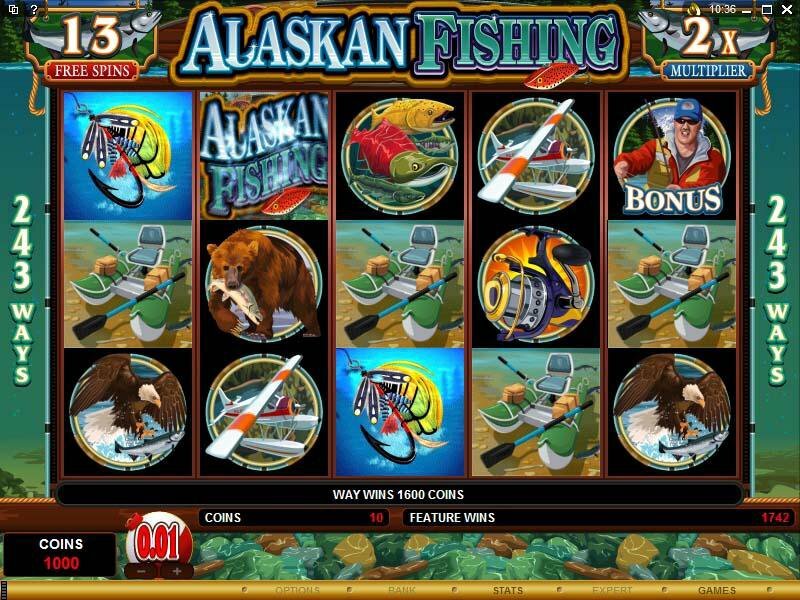 Similar Slots: If you like Alaskan Fishing, you might like these other 5-reel slot machines: Good to Go, Ladies Nite, Secret Admirer, The Adventures of Galactic Gopher, Tomb Raider.